South Africa: Will South Africa Turn Mandela's Language of Peace Into Action? 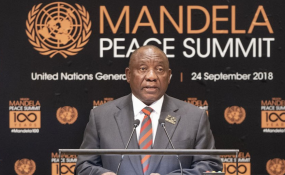 President Cyril Ramaphosa worked hard to invoke the spirit of Nelson Mandela at the United Nations (UN) and more generally in New York this week. Whether it was in unveiling a life-size bronze statue of Madiba in the UN building, or addressing the Council on Foreign Relations, or at the many business forums he addressed, Ramaphosa recalled Mandela often. And of course the Nelson Mandela Peace Summit on Monday in the UN General Assembly Hall was all about Madiba. The summit was held, at South Africa's behest and in partnership with Ireland, to mark the centenary of the birth of South Africa's legendary statesman who died in 2013. The summit adopted a declaration that recognised 2019 to 2028 as the Nelson Mandela Decade of Peace. The declaration also saluted Mandela for his humility, forgiveness and compassion, acknowledging his contribution to the struggle for democracy and the promotion of a culture of peace globally. The declaration reaffirmed all the familiar sentiments, including recognising that peace and security, development and human rights are the interdependent pillars of the UN system and all are necessary for sustainable peace. 'We resolve to move beyond words in the promotion of peaceful, just, inclusive and non‑discriminatory societies,' leaders pledged. 'We hope we will prove ourselves worthy as the bearers of the legacy of Nelson Mandela,' Ramaphosa said in addressing the summit. That hope was echoed by most speakers, over 40 of whom were heads of state. So many leaders wanted to address the summit that it had to be held over to be completed next week. Resolving to move beyond words, as the summit declaration did, was however somewhat ironic given that the declaration contains no real commitment to any specific action, not even in the often-dubious form of an action plan. If anything, the declaration tends towards passivity by the international community. It reaffirms the responsibility of individual states to protect their own populations from genocide, war crimes, ethnic cleansing and crimes against humanity. It recognises the need to mobilise the capabilities of the global community to help states exercise this responsibility - but only at the request of those states themselves. Allan Ngari, senior researcher in the Transnational Threats and International Crime programme of the Institute for Security Studies (ISS) in Pretoria, believes this 'reflects a rejection of, or at least a recognition of, the failure of the Responsibility to Protect (R2P) doctrine that justifies intervention by the international community in member states - even when those states are unwilling - to stop genocide, war crimes, ethnic cleansing and crimes against humanity'. Ngari notes that most states have supported the R2P rhetoric but in reality there have been virtually no such interventions. And it was surely significant that none of the heads of state nor governments of the Permanent Five - China, France, Russia, the United Kingdom and the United States - addressed the Mandela Peace Summit. There is something of an invisible barrier between the General Assembly on one side and the Security Council on the other at UN headquarters. That barrier could be characterised as the interface between rhetoric and reality. The General Assembly often proposes but it is the Security Council that almost always disposes. And so with the Mandela Peace Summit, which was very much a General Assembly event. However, even if the peace summit won't bring world peace, there is no doubt that it was good for South Africa; adding much-needed lustre to its reputation at the UN, and internationally. That reputation was tarnished by the Jacob Zuma years. An official of that era recalls how South Africa's Department of International Relations and Cooperation was as much 'captured' as other government departments and agencies such as Eskom, Transnet and the Treasury. They're better known now for having served the interests of the 'Zupta' network of former president Zuma's family and business cronies, the Gupta brothers. Ramaphosa and his international relations minister Lindiwe Sisulu are starting to clean out that messy stable, in foreign affairs and domestically, though it will no doubt take a while. But if resurrecting the image and spirit of Mandela at the UN and beyond in New York this week was helpful to South Africa, was it also helpful to the UN and the international community? Other Security Council members are drawing up a long list of corrective actions for which they would like South Africa's support, from curbing Syria's chemical weapons to holding Joseph Kabila's feet to the democratic fire. They want South Africa to do more than just speak the language of peace as in the Mandela peace declaration. They want action. They want to see South Africa's diplomacy, especially in Africa, go well beyond just putting the national interest before the Zupta interest. They would like to see Pretoria doing more 'heavy lifting' on the continent. South Africa is expected to use its clout to push wayward leaders like Kabila and Burundi's Pierre Nkurunziza onto the path of real democracy and therefore stability and prosperity for their own countries and the continent. At the highest levels of South Africa's government, there's an uneasy awareness that a disaster is looming around the Democratic Republic of the Congo's December elections, for instance, and that it will inevitably fall to Pretoria to resolve it. But officials don't seem to be quite sure what they should do about it. It's time for a serious indaba with the ghost of Madiba.